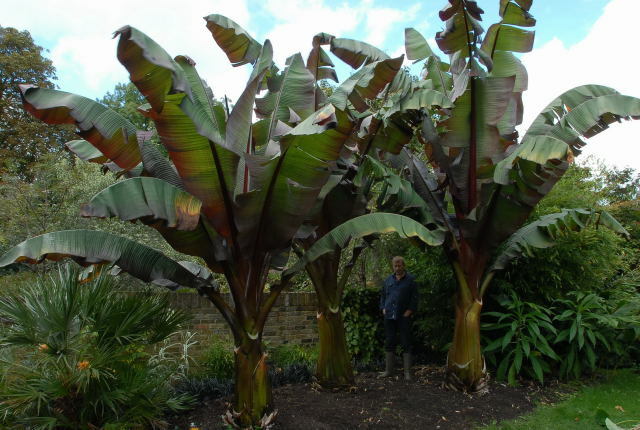 Ensete Ventricosum or Abyssinian Banana - the über plant of the subtropical world. Available in traditional green (Ensete Ventricosum) or with a rather fetching reddish tinge (Ensete Ventricosum 'Maurelii'). Both plants grow large very quickly, making them by far my favourite landscaping plants. Once settled in and happy, these plants truly are, to use a much trivialised word - awesome. As growing plants - both varieties. 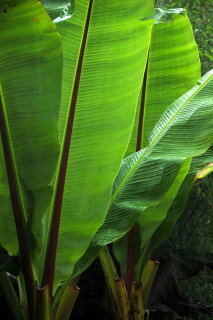 Unfortunately it is only possible to raise the green Ensete Ventricosum from seed. Germination of Ensete Ventricosum describes the process of raising these magnificant plants from seed and through their first season of life, whether grown in pots or in the soil. Plus how to deal with any overwintered plants that pig-headedly refuse to grow. Growing plants are available from specialist nurseries and increasingly from bog standard garden centres. 'Maurelli' is marginally more expensive due to its production techniques. Micro propagation or tissue culture is the process. Scientists wearing white coats and protective goggles, swirling test tubes in some secret lab have managed to bring the price of this super plant down to that of a bunch of flowers. Not a bunch, I hasten to add, sold at congested road junctions by soot laden refugees. More in the region of your mother's day bunch. A well prepared soil is essential to get the most from your plants. Plenty of home made compost and composted manure dug into the planting hole along with regular watering, will see your Ensete Ventricosum comfortably through the season. As with all plants, a good soaking every few days is more beneficial than a daily sprinkle. A useful feature of this plant is the apparent lack of pests and diseases when grown outdoors. As the season progresses, your plant will grow successively larger leaves. Each new leaf unfurling to reveal another eager young leaf within. The emerging leaves are held pert and upright. As the plant continues to grow, the older leaves begin to droop, bending downwards. When this happens it is a good idea to remove them. The plants have a more impressive look when the leaves are held skywards in shuttlecock fashion. When removing the older leaves, make sure you do not cut them off too close to the stem. 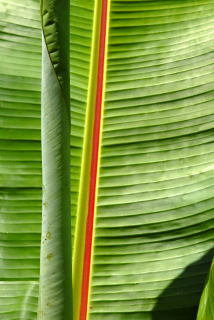 The stem of Ensete Ventricosum is not strictly a stem but a collection of leaf bases known as a pseudo stem. 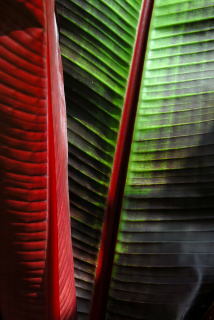 Each leaf contributes to the sturdiness of the plant. Do not remove leaves from the stem unless they have come away on their own. Even then use caution. Inevitably the summer will come to a close. By early autumn you will need to decided the fate of your plants. Unfortunately these plants are not contenders for growing outside during the winter. I, and many others have attempted to bring them through the winter outdoors. Even with a combination of a mild winter, thick lagging and an early warm spring, these plants just will not co-operate. I have tried warming the soil using clear plastic sheeting but to no avail. Eventually the stumps will just be in the way and have to be removed. I often feel as I am hacking them down, that they are not truly dead, particularly the inner core. Our summers are just too short and cool though, to pull it off. If you don't have a greenhouse it is time to say farewell. It is said that they can be dug up and overwintered in a garage, but I have no experience of that so I couldn't possibly comment. If you have a frost-free greenhouse then you can relatively easily save your plants to fight another day. 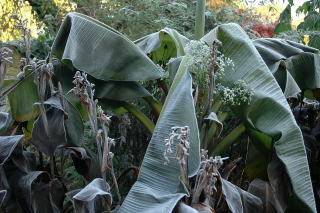 Here is how to do it - Overwintering shows you how to prepare your Abyssinian banana for winter. This will involve removing most of the leaves. Digging the plants up and transferring them into a frost free greenhouse. How to keep your plants happy over winter and how to deal with any pests. Planting out shows you the steps involved in replanting your overwintered plants. From soil preparation to the final planting of your plants.